Torriden Cellmazing Centellareal Serum Review: Hella Amazing! If you saw my instagram post a couple of weeks ago, I was given a chance by Althea to haul for my Eid Celebration (THANK YOU ALTHEA!) One of the items that I got was the Torriden Cellmazing Centellareal Serum. 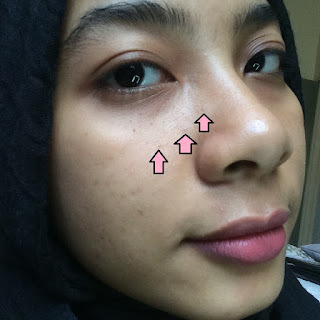 After more than a year that I'm getting serious with skincare, I realized that ingredients of the products are much more important than what it claims it can do and its reputation. Sure, I'm still attracted to the sleek and shiny packaging and the sleek aesthetic of some brands, and sooo enabled when my friends gushed about a product that works for them, but I feel that it is the time for me to "listen" to my skin and keep track on what I put on it. All of them contains Centella Asiatica Extract (Asiatic Pennywort/ Pegaga), Physalis Alkekengi (Chinese lantern/ Winter cherry) and Calendula Officinalis Extract ( English Marigold). I've been on a Centella kick lately because it helps my blemishes to shrink and heal, much faster than Tea Tree and still gentler than Benzoyl Peroxide (BP). The serum that I bought contained 43% Centella Asiatica extract, 24% Physalis Alkekengi Extract and 9% Calendula Officinalis Extract. All of them constitutes for more than 70% of the ingredients which are amazing! There is no silicone or alcohol, which is really great for sensitive skin. The triglycerides in the serum is a potential pore clogger, but my clog-prone skin survives it so that's a big relief. Nonetheless, give this a patch test first especially if your skin is oily. I ran the ingredients on skincarisma in case you would like to see the full ingredient list and their function and rating. Sorry for the blurry pic. Hope you can still read them! And all of these came with a really affordable price tag of RM43 (PHP 520 / USD 10). The serum is 30 mL and comes in a Tiffany Blue tube, so it's actually quite convenient and hygienic. In total, it comes to about RM1.44 per mL of the serum, which is not bad at all. In fact this might be one of the cheapest serums that I had ever purchased for myself. I got mine using credit courtesy from Althea Korea as a part of my Raya Haul, and I will definitely repurchase this in the future. Dare I say that it's my HG? It's a little bit too early to say so, but there is a huge potential that it will be a staple in my skincare routine! The serum has a lotion/light cream consistency and is really easy to spread. Although that it looks like it's thicker than other serum formulas (which is usually liquidy), it is not heavy at all and sinks in quite fast. I found that apart from the brightening effect, it really does give me some light hydration layer so I can just skip essence or cream before sleeping. Keep in mind that I have oily skin so I will usually hydrate without using too much emollient/ rich cream - they can easily clog my skin and breaks me out. It has no strong scent to it and is really soothing when applied. I use the serum in both my AM and PM routine when I was treating my pimples, but I have since cut it down to only PM routine as I'm testing out a sunscreen that doesn't seem compatible with the serum. I'm planning to incorporate the serum in my future routine twice everyday when I have any blemishes and once in the evening when my skin is clear. No Ingredients list in english but they included warning and their claim on the side of the box. I like how it comes with customer centre number and all. After toning, I use the serum all over my face (not just on the pimples) and just tap them into my skin using my palms. It will usually sinks in really quickly with minimal stickiness (like you had some moisturizer on). Then I will proceed with sheet masking and/or light cream or sleeping mask. And it all comes to one thing, does it really work? And holy schmoley does it do it job and more! I've included some pictures below to show how it works in healing my pimples that I even picked and popped with very (very very very) minimal scars. I didn't even use any pimple patches! 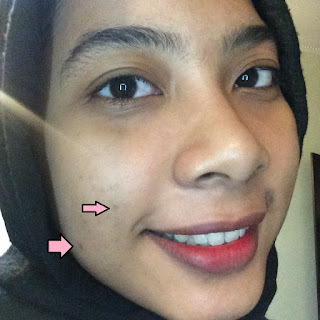 Just as a record, my skin is really prone to Post Inflammation Hyperpigmentation (PIH) or the layman term; acne scar. It took me more than 6 months to lighten up my scars to what it is now with hydration, Melano CC, regular sunscreen, and tons of patience. Even so, I will still get occasional one or two pimples that will leave me a dark acne scar and I'm forced to start all over again. So getting really light scarring after a cluster of pimples decided to screw me after a day of Eid is really such an impressive feat for me. Day 7 of using the Serum! At this lighting you can't even see there is anything there! Close up: There is only really minimal scarring left. This lighting shows my PIH better, but the new scars didn't even show up that well. So impressed! The scars on my cheek took 6 months to lighten to where they are now. The arrows show my recent scarring before I'm using the Cellmazing serum just as a reference on how bad my PIH/acne scar usually shows up. Am I the only one who think the serum is so incredible? I am truly impressed with the performance, and with the price tag, I can see myself repurchasing this serum in the long run. However, I would like to give this serum a longer trial, and will update this post in the future in case I changed my mind (which I did with few of the products that I used). I used my Althea credit courtesy of Althea to get this product, but all opinions formed are honest and of my own.